This entry was posted in Back door openings, Backdoor openings, Balance, Bliss Tips, Child's perspective, Influence, Personal growth, Pets, Photography, Planting Seeds, Reflections and tagged athiest, Back door openings, Christian, faith, God, golden retriever, Inspiration, pets, Planting Seeds, puppy, Sneaking Bliss by MaryALivingston. Bookmark the permalink. God finds ways of speaking when he needs to heard. Wonderful story. I’m sure you miss Tessa terribly. Thank you, Mary. Tessa lived a good long life. 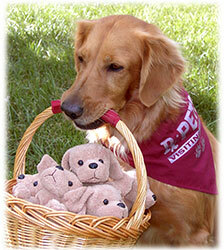 Sixteen is very, very old for a retriever. She was active till the day she passed. She was a joyous girl and reveled in this bliss called life. My heart is at peace, she will be a part of me always. This is a beautiful story. We dogs know things that humans can’t seem to fathom. And sometimes it’s really hard when we can’t talk and tell you things. It makes me want to dance when things turn out just like they’re supposed to. Tessa is watching. Thanks for sharing this bit of bliss. Rhythm, this is SO true! What a sweet story! God is able to use any situation to draw people to Him! What a lovely story. Sweet Tessa. Thanks, Pam. She was a wonderful girl and truly the standard we compare all mama dogs to. I was amazed at how she hardly greyed. 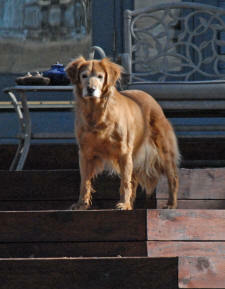 The photo of her standing on the deck was taken only a couple of weeks before she passed. She passed the best of herself on to her offspring. Gussie will be missed too.